"The current version of the MSI Wind, called the U160, happens to stand out from the crowd in a couple of ways. It boasts some of the longest battery life we've seen, at 7-plus hours, and it ran some of our benchmark tests just a few seconds faster than other Netbooks. It's not enough of a performance difference to notice in real-world use, but if you're looking for the maximum possible battery life, the Wind is certainly up there. This extralong life, however, comes at a price. First, the system's massive battery sticks out significantly from the bottom of the chassis, like some kind of awkward kickstand, and second, the Wind U160 costs $380 (although the official list price is even worse: $429), which is $80 more than largely comparable machines from other PC makers." 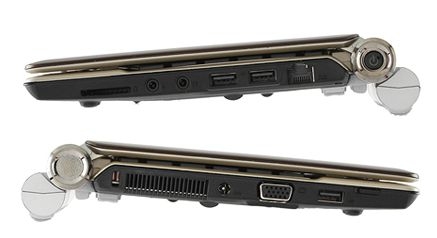 The MSI Wind's netbook protrudes a bit from the main battery component. Really, for such a large battery I'd expect better than 7 hours of battery life. At least it appears somewhat well designed to provide a bit of extra lift rather than just sticking straight out the back.